The Tiliaceae are trees, shrubs, or rarely herbs comprising about 50 genera and 450 species that are further characterized by the presence of branched or stellate hairs. 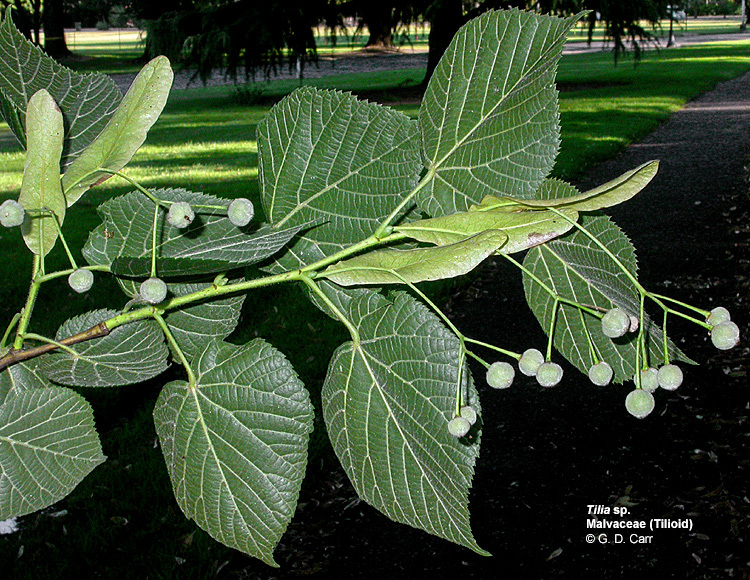 The leaves are simple and nearly always alternate, stipules are present. 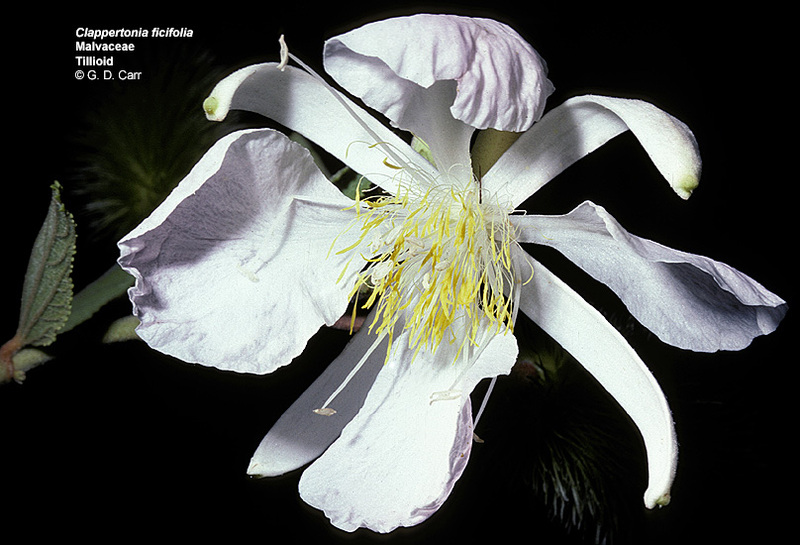 The flowers are actinomorphic and nearly always bisexual. The perianth consists of a valvate calyx with usually 5 distinct or basally connate sepals and a corolla of an equal number of petals or sometimes the corolla is sepaloid or absent. The androecium consists of usually many stamens that are distinct or basally connate or in fascicles. The gynoecium is a single compound pistil of 2-10 carpels, an equal number of stigmas, and a 2-10-loculed superior ovary with 1-several axile ovules in each locule. The fruit is variable. 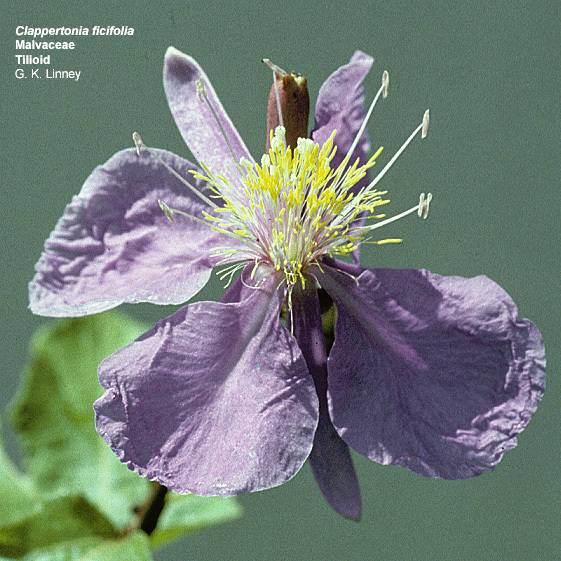 Clappertonia ficifolia. 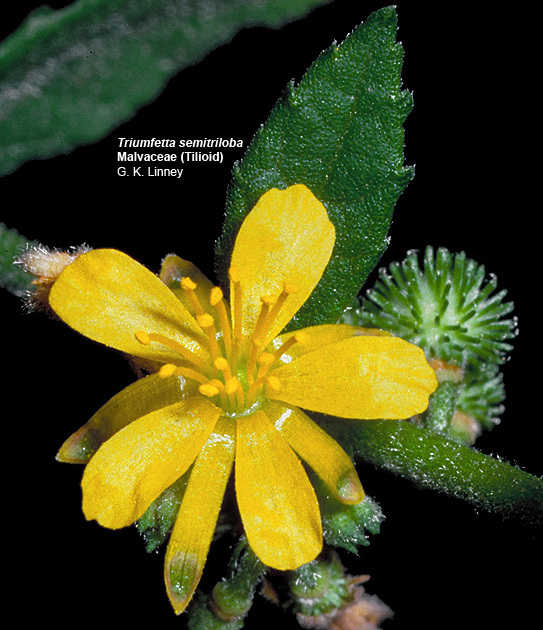 In this species the perianth is 4-merous and the sepals are petaloid. 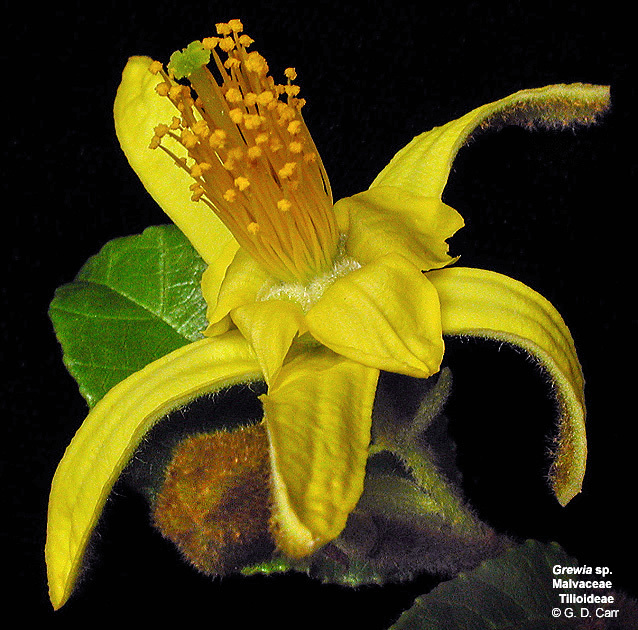 Numerous stamens are evident. Corchorus olitorius, jute. 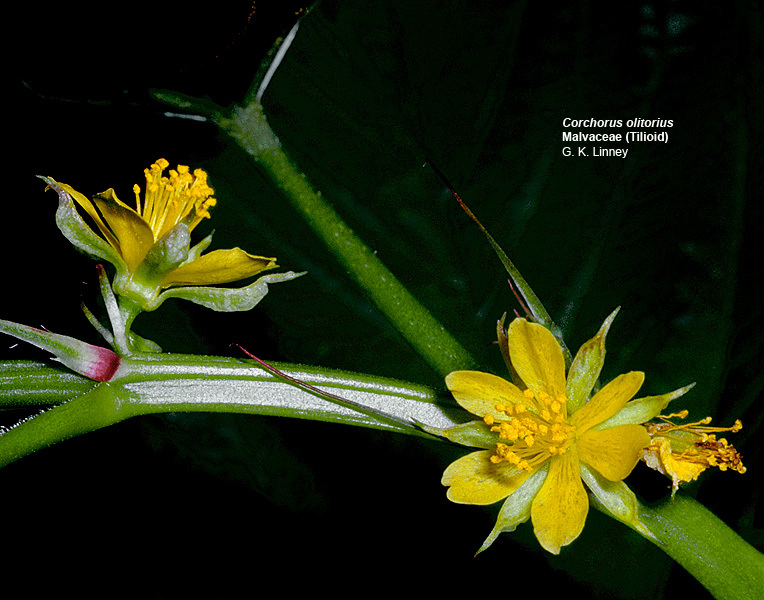 Note the 5 or 6-merous, differentiated perianth and numerous stamens. Conspicuous stipules are also visible. 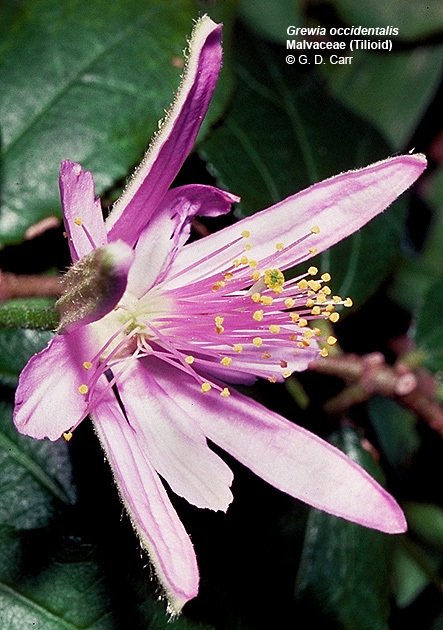 Grewia occidentalis. Note numerous stamens, sepals petaloid on front, green on back. 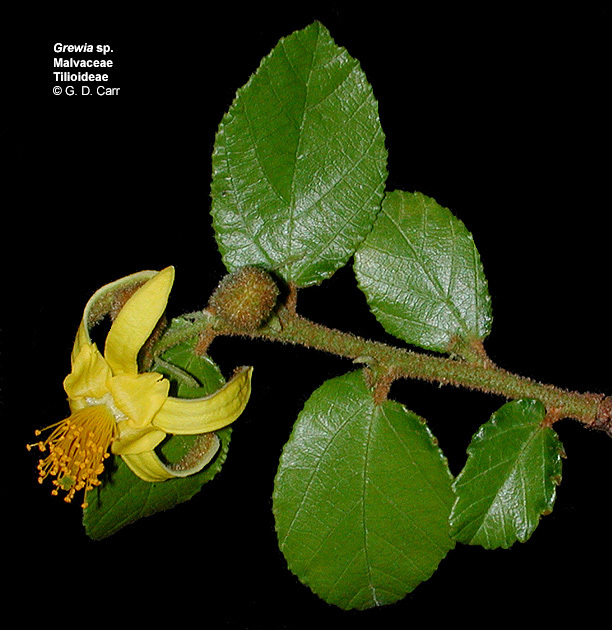 Grewia sp. Ho'omaluhia Botanic Garden, Kaneohe, HI, fall, 2003. 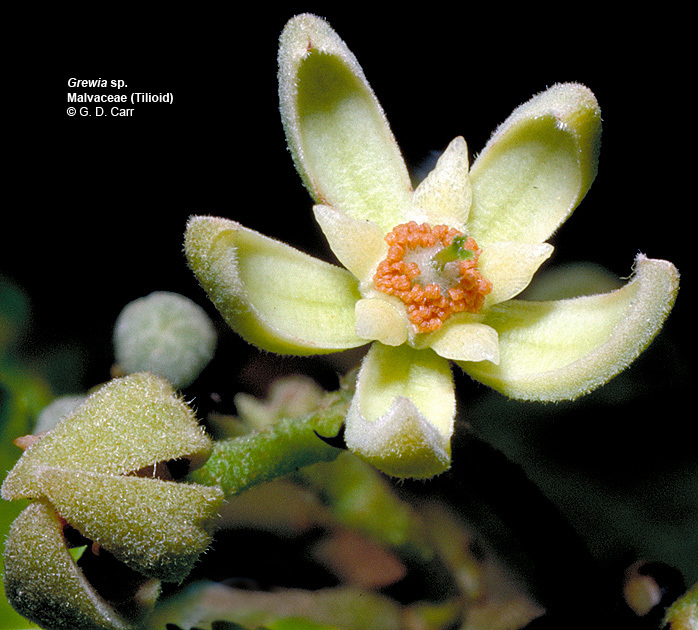 Grewia sp. This photo clearly shows the valvate nature of the calyx that is typical for this family. The petals are somewhat smaller than the sepals. Numerous brownish stamens are nestled around the ovary. 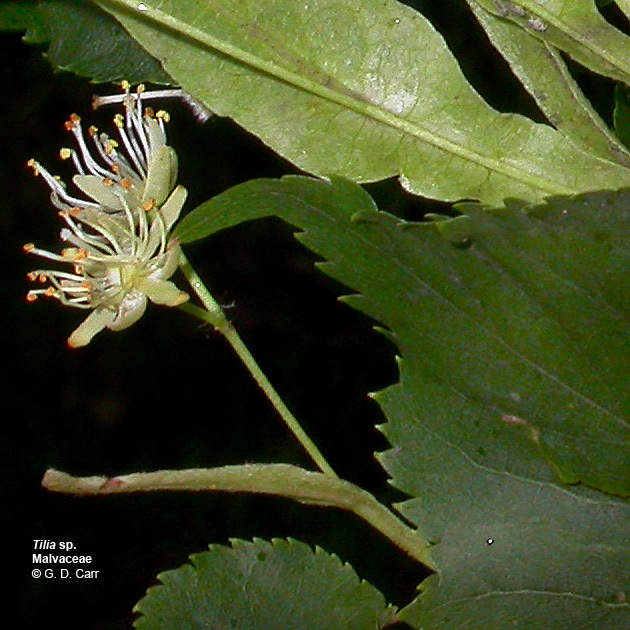 Tilia sp., basswood, vic. Corvallis, OR. Triumfetta semitriloba, Sacramento bur. Note the five-merous perianth whorls. In this case the calyx is somewhat petaloid, at least on the front surface.